Intermodalism is the use of several modes of transportation to accomplish a single movement of cargo. A shipment is intermodal primarily by virtue of its physical characteristics. For example, cargo loaded into a container is moved by truck, then by vessel, and finally by train to its final destination. Intermodal may also be a contractual description. In this case a carrier may subcontract portions of the move, while presenting the shipper with a single Bill of Lading under which the move is performed. In contrast to the separate evolution of the laws of common carriage by land and by sea, ocean intermodalism developed as a result of land based transportation practice, not separate from it. A worst-case scenario would arise if port access was denied, forcing the war reserve materiel to be downloaded at Diego Garcia or Guam and airlifted to a forward operating location. One major challenge is the inter-modal problem; that is, sealift and land utilize 20- or 40-foot containers, and airlift requires 463L pallets. Before the development of the Air Force's 463L Materials-Handling System, individual pieces of cargo were floor-loaded by hand. However, as aircraft grew in size and productivity, cargo-handling and aircraft-loading efficiency were upgraded. The changes involved areas like the in-plane air-cargo systems, materials-handling equipment (MHE), and containers and pallet/net combinations, known as unit-load devices (ULDs). Military and civil transport aircraft were originally handled in the same way. But significant differences between the two airlift systems have evolved over the years. The military system relies heavily on the 88" X 108" pallets of the 463L Materials-Handling System. The civil system relies to a greater extent on containers and the 88" or 96" X 125" civil pallets. The 463L cargo system includes a pallet of metal sandwich construction specifically designed for palletizing and transporting air cargo on roller type conveyors in the terminal, restraint rails and roller conveyors in the aircraft and cargo loading and unloading vehicles. It is equipped with locking arrangement for locking the pallet into the aircraft rail system for restraint during flight and tie-down rings to secure the NET, CARGO TIE-DOWN, AIRCRAFT PALLET. Excludes PALLET, MATERIAL HANDLING. The 463L pallet is made of corrosion-resistant aluminum with a soft wood or fiberglass core and is framed on all sides by aluminum rails. The rails have 22 tie-down rings attached with 6 rings on each long side and 5 rings on each short side. Each ring has a 7,500-pound restraint capacity. The rails also have indents (notches) that accept the detent locks located on numerous types of materials-handling equipment and on all airlift-capable aircraft. The overall dimensions of the 463L pallet are 88 inches long by 108 inches wide by 2 1/4 inches thick. However, the usable dimensions of the upper surface are 84 inches wide by 104 inches long. This allows 2 inches around the periphery of the pallet to attach straps, nets, or other restraint devices. An empty 463L pallet weighs 290 pounds (355 pounds with a complete set of nets) and has a maximum load capacity of 10,000 pounds. The maximum pounds per square inch for the 463L pallet is 250 pounds. If a load exceeds this limitation, then shoring must be used to spread the load over a larger area. The 463L cargo system includes the pallets, nets, MHE, and aircraft rail/roller systems. The pallet is made of aluminum skin with a wood or fiberglass core and is framed on all sides by aluminum rails. The rails have 22 tie-down rings attached with 6 rings on each long side and 5 ring on each short side. Each ring has a 7,500 pound capacity. The overall dimensions of the 463L pallet are 88 X 108 inches, with usable dimensions of 84 X 104 inches. This allows two inches around the load to attach straps, nets, or other restraint devices. An empty 463L pallet weighs 290 pounds and 355 pounds with nets. The dual-rail system is installed in all airlift or 463L-capable military aircraft. This system consists of rows of rollers that allow the palletized cargo to easily move into the aircraft. Many of these rollers are stowable to convert the cargo deck to a flat, clear loading surface for wheeled cargo. The side rails guide the pallets into the aircraft and provide lateral and vertical restraint. These rails are equipped with detent locks that hold the pallet securely in place once inside the aircraft. These locks also prevent the forward and aft movement of pallets during flight. 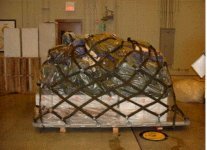 Cargo is secured to the aircraft floor using tiedown equipment organic to the aircraft or provided by the local air terminal. 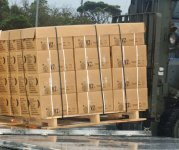 However, to secure cargo to pallets, units must procure and control their own pallet couplers, plastic coverings, tiedown equipment (less nets), and dunnage and/or shoring. It is not the responsibility of the local air terminal to provide this tiedown equipment to deploying units. Tiedown equipment is subject to one-for-one exchange. 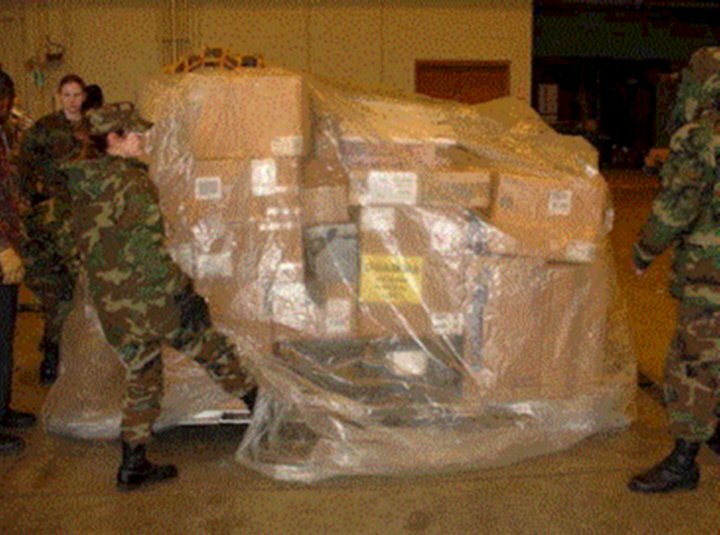 A Pure Pack Pallet is 463L aircraft pallet that contains shipments for a designated destination including cargo for one or more specified Department of Defense Activity Address Code, Supply Support Activity or unit, as determined by the requirements of the Combatant Commander. System 463L pallets and nets are essential to the effective use of the military airlift system. In normal operations they reduce aircraft ground time and allow for load preplanning. In emergency situations their availability at the right place and time can be the determining factor in the mission's success or failure. Steadily increasing costs require that these critical assets be managed carefully. The Force Provider is a transportable base camp system that provides housing and operation space for a variety of military missions ranging from support of a small military outpost to a fully operational, forward deployed base camps and airbases. USAF's Harvest Falcon 1,100 person encampment provides flight line operations, industrial support facilities, and housekeeping functions. 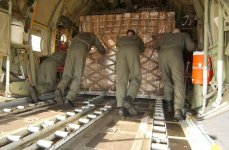 The Harvest Falcon package is deployed by 15 sorties of C-130 aircraft using the 463L pallet system. USAF's Harvest Eagle (upgraded) 550 person encampment provides for flight line operations, industrial support facilities, and housekeeping functions. 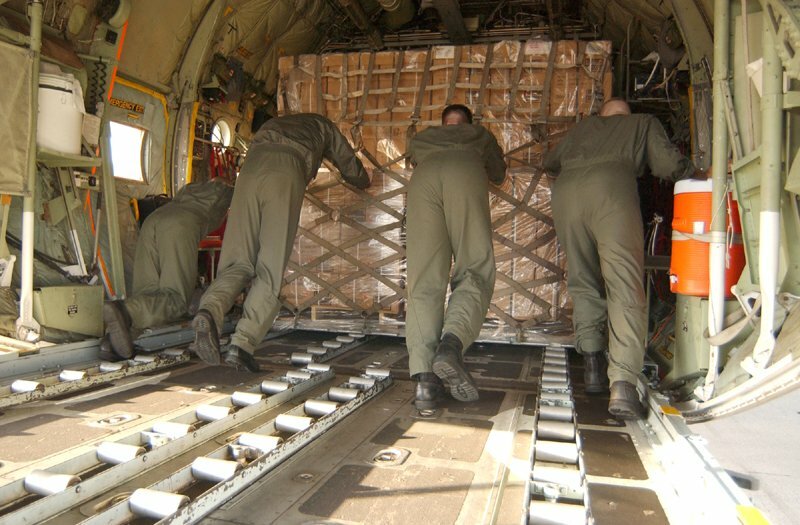 Harvest Eagle package is deployed by 8 sorties of C-130 aircraft using the 463L pallet system. Pallets and nets interface with the aircraft's cargo restraint system with extremely close tolerances. They are easily damaged when used for other than their intended purposes. For that reason, units will not palletize cargo for movement by surface modes of transportation, except during inspections/exercises or for special programs. The DOD manages pallets and nets under two different systems. One system covers bar reserve material (WRM) and the other manages routine (daily) air cargo operational assets. The DOD now manages pallets and nets under established readiness authorizations, as WRM, The Air Force Equipment Management System (AFEMS), or its DOD component equivalent, segregates and controls these assets. These assets are separate and distinct from daily operational pallet and net levels and, for the Air Force, are subject to the controls in AFR 400-24. There are three nets to a set: one top net (yellow/tan) and two side nets (green/black). The side nets attach to the rings of the 463L pallet and the top net attaches by hooks to the rings on the side nets. Nets may be tightened using the adjustment points. The 463L pallet system and nets will restrain up to 10,000 pounds of general cargo 96 inches high. Begin building the pallet by placing three points of dunnage (4 X 4 X 88 inches) underneath the pallet. Start with the heaviest cargo, and distribute the weight out from the center. This will keep the pallet from becoming too heavy on one end and help maintain the pallet CE. Position cargo right side up with special handling labels facing out. Load in a square or pyramid shape whenever possible to make the load stable. 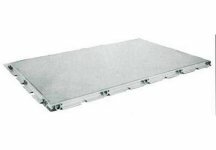 Cover the pallet with a plastic 463L pallet cover, NSN 3990-00-930-1480. Before using the nets, lay them out and inspect for severability. Do not use nets that are torn, rotten, have loose stitching, or have bad or missing hooks. Only one bad strap or hook is enough to make the entire net unserviceable. Identify the long side (6 hooks) and short side (5 hooks) of the net and position so the hooks point inward while attached to the pallet rings. Place the two side nets around the cargo and fasten the hooks to the rings on the pallet. Make sure the straps of the net cross at the corners. Pull the net as high over the cargo as possible, but do not tighten the straps until the top net is hooked in place. Center the top net over the cargo, with the long and short sides lined up to the side nets. Hook the top net into the side nets using the O-rings located at the top and middle portion of the nets. Never use the bottom O-rings to secure the top net. Top net hooks should face inward, unless cargo can be damaged by the hooks. When the top net is in place, two people should pull evenly on all the straps opposite of each other to tighten the top net. Tuck the loose ends of the straps into the netting to prevent snagging during loading operations. 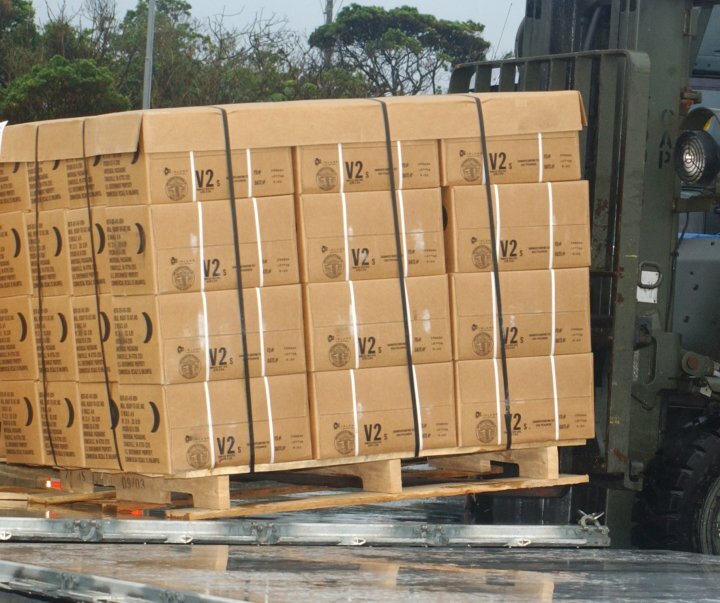 Mark pallets on adjacent sides with a military shipment label (DD Form 1387), and any required documents such as hazardous cargo declaration, or other identification markings. Ensure items are placed in a weather-proof shipping envelope or on a pallet identification board. Pallets are available to units planning or executing an air movement through their TO from AMC. The user is responsible for building 463L pallets and may be responsible for loading them onto aircraft. FM 55-9 provides detailed guidance on pallet building and documentation. Pallets are compatible with materiel handling equipment (MHE) and aircraft rollers, rails, and locks. In order to stay in serviceable condition pallets must be supported by 3 pieces of dunnage. Dunnage may be lumber or plastic with the approximate dimensions 4" x 4" x 88". If pallets are stored in a stack, they should have some slope so rainwater does not pool on the pallet and rot the balsa wood core. Pallets must always be sent with 2 side nets, 1 top net, and 3 pieces of dunnage. 463L-Compatable Bins are usually referred to as ISUs, ISU 60s, ISU 90s, or Cadillac bins. An ISU or Cadillac bin is a container built with a pallet bottom. Typical heights are 60 inches (ISU 60) or 90 inches (ISU 90). ISUs may be used only if justified for high value assets. Their use must be approved by the Functional Area Manager (FAM) and pilot unit for the particular UTC. ISUs should not be used if not approved for several reasons. An ISU weighs 1200 pounds more than a pallet with side and top nets. Since airlift is so expensive and in high demand, the extra weight is better used for moving UTC materiel versus the container itself. C-130s require a 6" aisleway for pallets in the wheel well positions 3 and 4. Many ISUs don't have the necessary aisleway. The materiel in those ISUs would have to be pulled out and rebuilt as pallets to take advantage of intratheater airlift, a manpower and time intensive transfer at locations which are already busy moving other materiel. 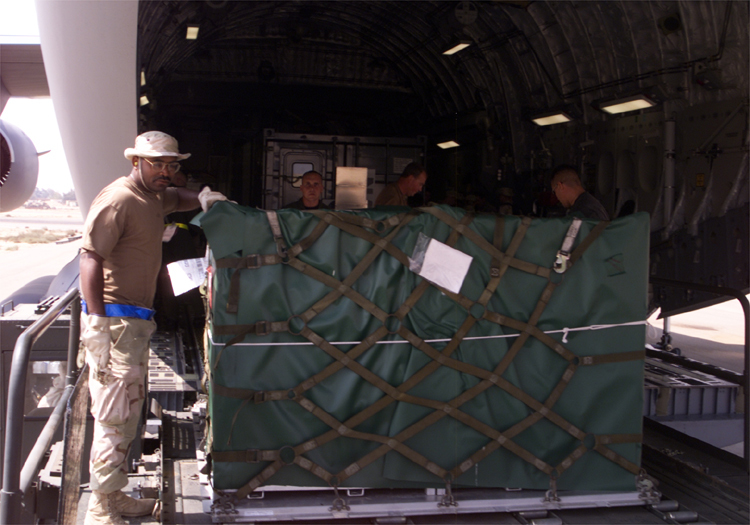 Other airlift, such as KC-10s, KC-135s, DC-8s, and others require the top of the pallet be contoured in order for the pallet to fit in the aircraft. If cargo shows up at a port and must be shipped on an aircraft with more restrictive contour, then cargo in bins must be pulled out and rebuilt onto 463L pallets, which creates extra workload. Hazardous cargo must be accessible in flight. If HAZMAT is moved in bins, then the bins must have special access doors in order for aircrew to inspect and reach the HAZMAT in the event of a mishap. The C-130 can accommodate up to six 463L pallets. Usable surface dimensions of a 463L pallet are 84 inches long by 104 inches wide. Pallet criteria according to position, weight, and height. For pallet positions 3 and 4, maintain a 6-inch aisle along the narrow side of the pallet. Do not exceed an overall dimension of 84 inches long, 98 inches wide, and 96 inches high. This will provide the necessary aisleway for emergency exit of the aircraft. For pallet position 6, maintain an 18-inch aisle. Pallet cargo dimensions will not exceed 86 inches wide, 84 inches long, and 76 inches high. This provides access to the latrine, cargo loading aids stowed in the cargo door, and to the aft escape exit hatch on the aft end of the cargo ramp. The C-141 can accommodate up to (13) 463L pallets. Pallet position criteria according to position, weight, and height. Pallet position 1, No aisle is required, Height restriction of 76 inches high and pallet position 13 has a height restriction of 76 inches and maximum weight of 7500 pounds. The C-17 can accommodate up to (18) 463L pallets. Pallet position criteria according to position, weight and height. Pallet positions 8 & 9 left and right can not exceed a combined weight of 40,000 pounds. All pallets must be rotated 90 degress while loading/unloading for this configuration. The C-5 can accommodate up to (36) 463L pallets. Pallet position criteria according to position, weight and height. Pallet positions 1-2 maximum weight of 7500 pounds and require a 14 inches aisleway on the outer edge of the short side. This will provide the necessary aisleway for emergency exit of the aircraft. Pallet positions 35-36 have a height restriction of 70 inches and a maximum weight of 7500 pounds and requires a 14 inches aisleway on the outer edge of the short side. This provides access to the latrine, cargo loading aids stowed in the cargo door, and to the aft escape exit hatch on the aft end of the cargo ramp.